''Hidcote'' is unusual in this series of contemporary oil paintings by Simon Davis in that there are small clues contained in the background of the painting as to setting and context. The small carved birds either side of the model may suggest the garden at Hidcote in Gloucestershire. The woman in the painting does, however, appear detached from the background both in style and thought. In ''Hidcote'' we see a woman in profile, apparently deep in thought. 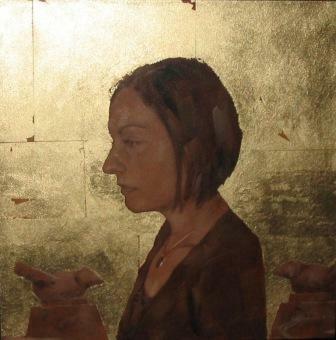 As with other paintings by Simon Davis, the work suggests many questions. Simon Davis has a background in graphic design and has often produced storyboards where he is required to plot movement. His studies of women''s faces are more contemplative but never flat, they always look fresh and real and full of life. Simon Davis currently exhibits at Red Rag Modern British Art Gallery and RBSA where he won the Tanner Charitable Trust Prize in August 2004. In addition to Red Rag British Art Gallery Simon Davis has exhibited at other leading British Art Galleries. Each painting at Red Rag is sourced from the Simon Davis artist studio and like all Red Rag British art and Contemporary art it can be shipped worldwide.